Live axles...What the heck is this? Can somebody explain what is going on here - I've just pulled a couple of back axles apart in order to build a spare with a different ratio and one of the axles had this half shaft fitted on one side - it's got a pressed on collar where the bearing flange should be and to be honest I can't see what was actually holding the whole thing in! Cars Owned::The Red Tomato, 1972, Triumph Spitfire 4 MK1, 1964. Is it pinned in some way? I wonder if there is a slight taper on the inside of the collar, and one on the inner part of the shaft, so that as the collar goes further in it tightens up? You could also try to reassemble the whole thing, lightly, and try to pull the half shaft out, to see if anything stops it. Possibly a damaged shaft which has been machined and reused with the collar. Something our friends over the pond might do? Well as an update - I cleaned up the shaft & measured it & there is a slight (couple of thou) size increase towards the back which is more than enough to hold the collar in place. 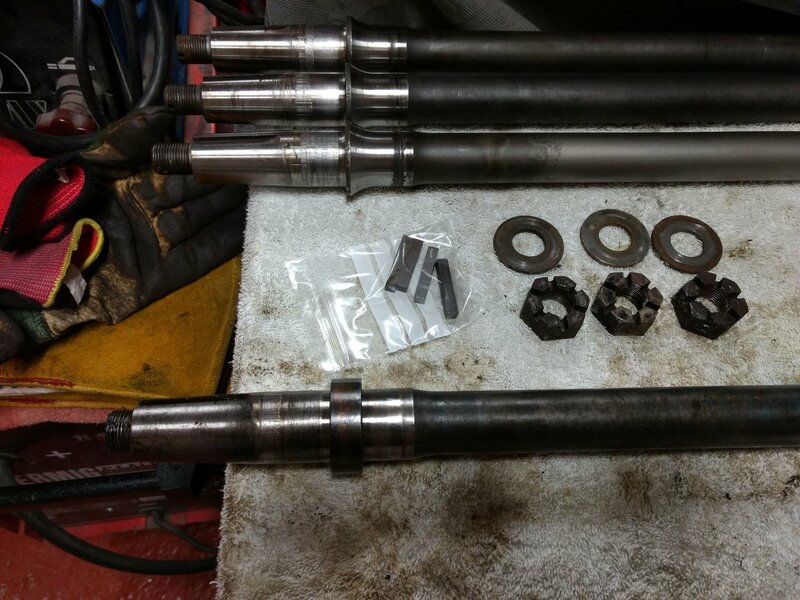 Interesting comment about our friends across the pond Mike, as that shaft came out of an American live axle 4A, anyway it's now gone to the scrap bin as I mushroomed the end of the thread removing the hub......and that was with the use of the proper Churchill hub puller. FWIW the solid axle used on a 4a is the strongest of all of them and is the one used by all the rally boys. What is different about them that makes them stronger? Stronger half shafts and casings and when used as above with 10"brakes works a treat.